Hope all of you who wanted to enjoy the savings on some awesome stamp sets offered during the Birthday Sale got your orders in on time … a special “Thank You” to all who ordered. 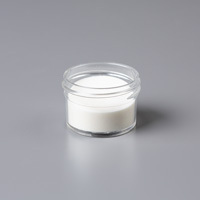 You’re going to love your new goodies!! The background is Garden Green and the several patterns of Designer Paper are from the Dashing Along paper (an earlier promotional item). The red ornament was created using Gold Emboss powder done on yet another pattern from the Dashing Along Designer paper. Two ornaments (baubles) were cut from the coordinating framelit set Detailed Baubles. If you purchase the two (stamp set and dies) together as a bundle, you can save 10%. 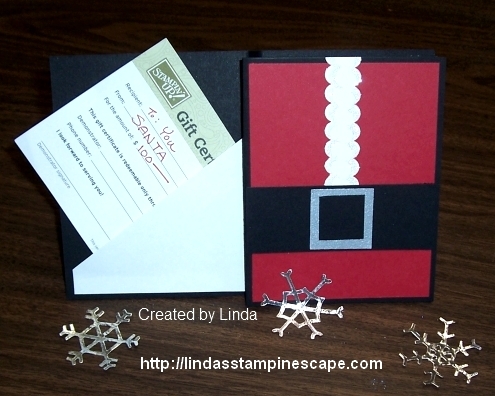 Simple … yet totally cute card that is easily replicated when making many Christmas Cards. Hope you enjoyed it. Thank you so much for spending part of your day with me. 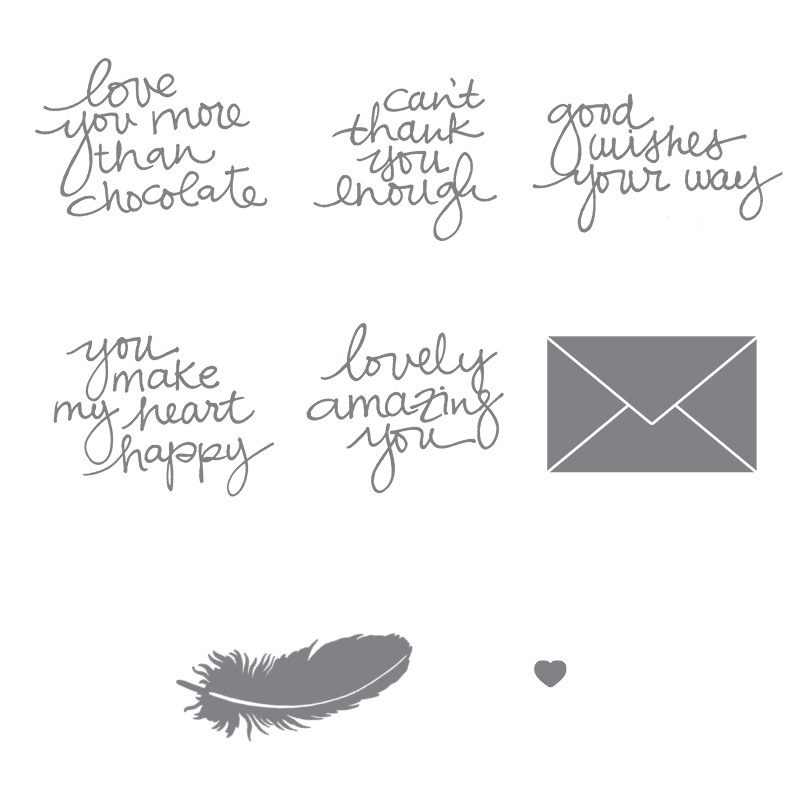 I’m so excited to share my first card made with our newest photopolymer stamp set … “Loving Amazing You”. This great new set is just what you need to spread happiness to all. Its so versatile, you’ll find yourself using it over and over again. Recommended clear block sizes are A, B, C (not included in the set). 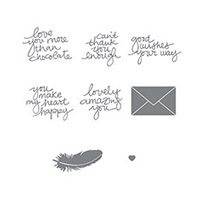 I wanted to create a simple, beautiful card … I love feather and all the greetings. I will definitely be sharing more from this stamp set with you. 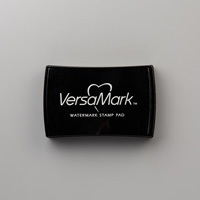 I stamped the feather with the VersaMark™ pad and embossed with clear embossing powder. 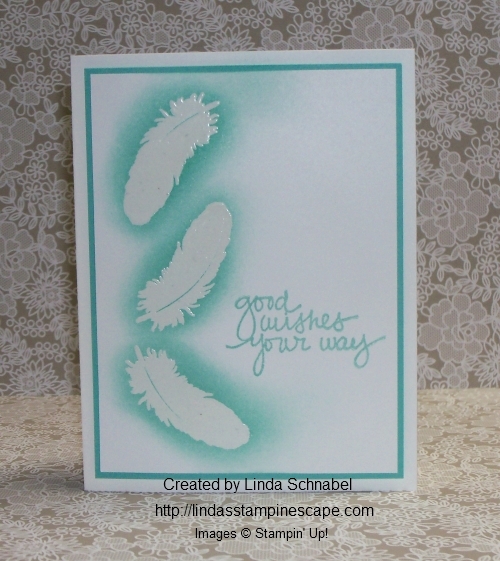 I then sponged “Coastal Cabana” ink over the feathers and also used it for my greeting. Just a pop of the Coastal Cabana between the two white pieces helps tie it all together. 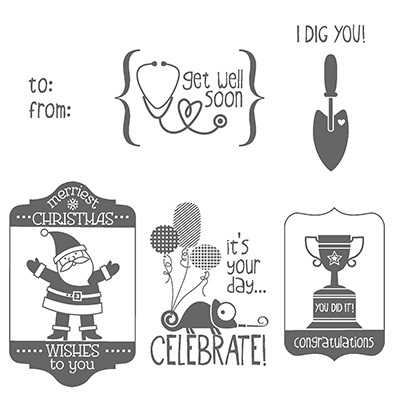 This card could be done in numerous different colors … pick your favorite! 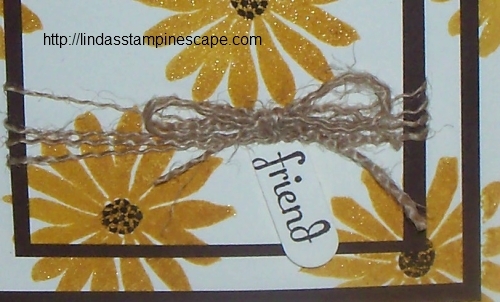 There is a little texture created by embossing but I wanted to add some dimension to the card to I popped up the front with Stampin’ Dimensionals. That is it … simple, yet beautiful. Burrr! Hope you’re staying warm. As we begin the day with a whoppin’ 5 degrees, I hear it’s going to warm up into the 20’s … just so it can snow! Oh well, that’s winter in Wisconsin! Today I will share with you my final “Silver & Gold” card (we’ll at least for a little while). 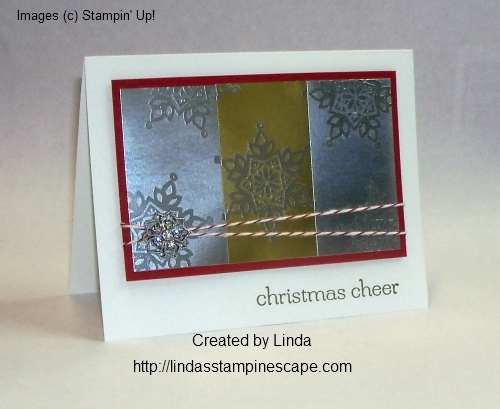 I couldn’t resist, I was just having too much fun creating with these fabulous foil papers. My card today highlights the “snowflake” from the “Festive Flurry” stamp set found in the Holiday catalog. Just to let you know, the holiday catalog purchasing period ends January 2nd. I heat embossed the snowflake with the silver embossing powder and cut it out with the coordinating “Festive Flurry” framelit dies. I then highlighted it with the rhinestones. 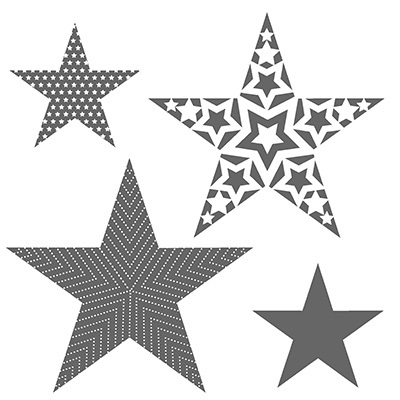 I used the Ovals Collection framelits to cut out an oval to showcase the snowflake. I also added a strip of the gold foil paper to the side, after embossing it with the “Stylish Stripes” Impressions Folder. I accented it with the silver ribbon, just to tie bring the card together. My greeting “Christmas Wishes” comes from the stamp set “Joy to the World” … I was really impressed with the stamps in this set and use them quite a bit on my cards. 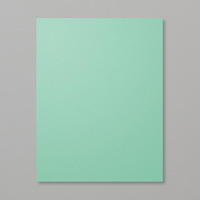 I used Very Vanilla cardstock as my base, it created a softer and warmer effect than using the white. Thanks for stopping by and I will be sure to show you something other than silver and gold tomorrow. There is still time to purchase “GIFT CERTIFICATES” for you friends and family … An awesome gift, just before the new “Occasions Catalog” is released and Sale-a-bration just around the corner. Wow … It’s cold outside today! We’ve got -4 degree windchills …. burr! I taped together (on the back) the silver and gold blocks to create the background. 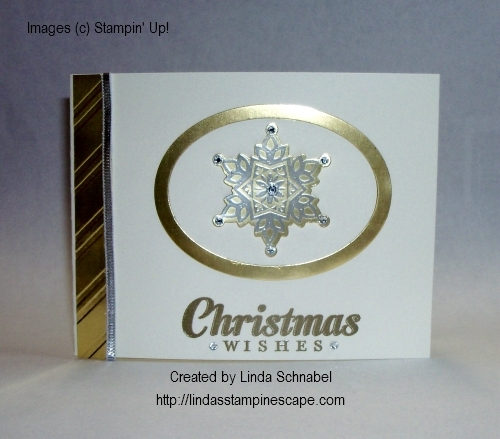 I then stamped the snowflake from “Festive Flurry” and heat embossed with silver embossing powder. I embossed a separate snowflake and cut it out with the coordinating Framelits. 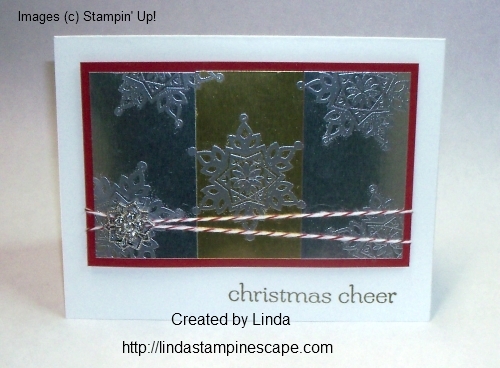 My “christmas cheer” greeting comes from the stamp set “Sweet Essentials”. Now to finish off the card I added the Cherry Cobbler Bakers twine and a “Frosted Finishes Embellishment”. The film is noted for its cast of up-and-coming stars, including C. Thomas Howell (who garnered a Young Artist Award), Rob Lowe, Emilio Estevez, Matt Dillon, Tom Cruise, Patrick Swayze, Ralph Macchio, and Diane Lane. 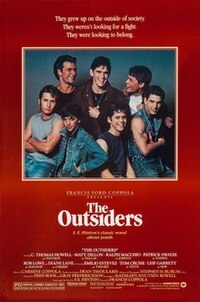 Ponyboy Curtis was played by C. Thomas Howell and Johnny Cade was played by Ralph Macchio… the main characters in the film. I like this movie and watch it whenever it’s on. It truly launched the careers of many of it’s cast. Staying with the “gold” theme … I followed the same technique as yesterday, embossing the gold foil sheet but I used the “Stylish Stripes” emboss folder on today’s card. 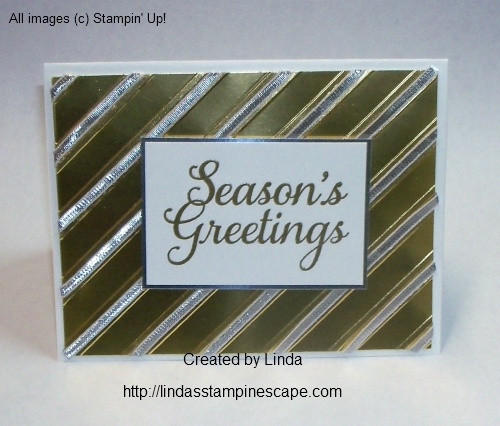 Then I secured the beautiful “Silver 1/8″ Ribbon” along the double stripes to create a cool effect. I promise I won’t go into the background of the holiday song … Silver and Gold sung by Burl Ives. However, I will ask … do you know what movie that hails from??? 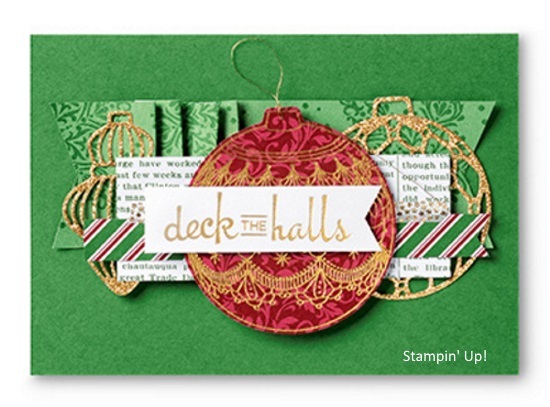 Keeping my card simple … I just added the “Season’s Greeting” greeting from the “Joy to the World” stamp set. 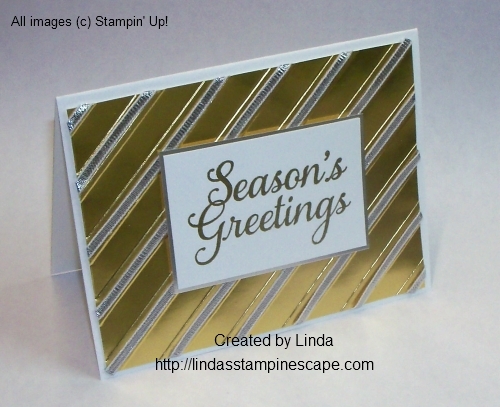 Again, I heat embossed it with gold emboss powder, then backed the greeting with the Silver Foil paper. 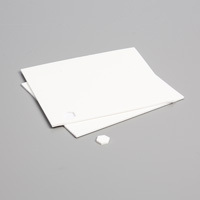 The base of the card is Whisper White. Many of the items used for this card are found in the Holiday catalog, and you can view by clicking on any of the “highlighted” words. How are you this fine Thursday? My wish for you is a marvelous day! 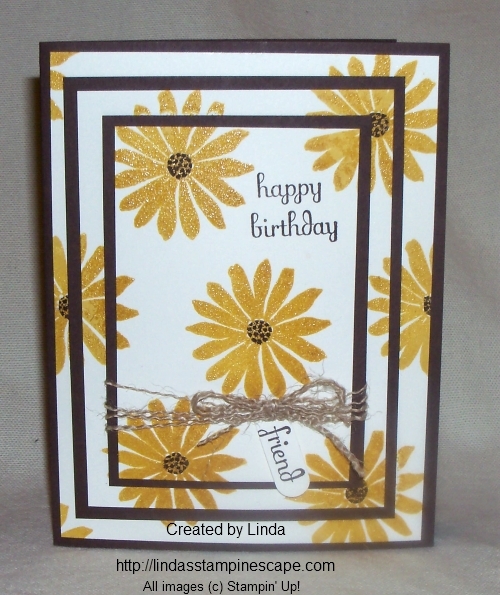 Today I am going to share with you, a birthday card that I made for a dear friend of mine who’s birthday is on Friday. We have been friends since the 5th grade (and that’s all I’m going to say about that) lol. My technique today is triple time. 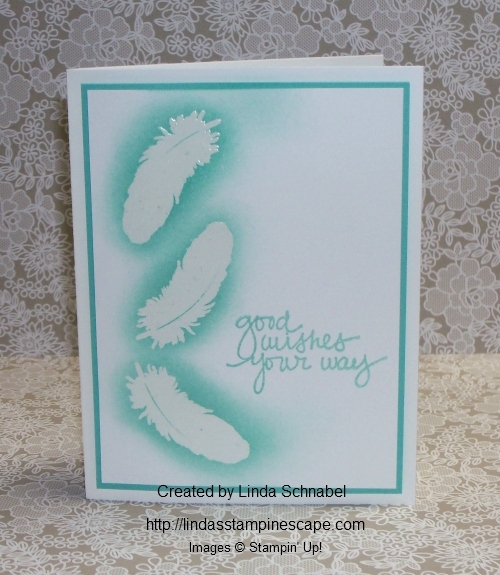 Simply layer your 3 light colored cardstock together when stamping, then separate and mat. I just love this technique, it’s easy and looks cool. I have used the “Secret Garden” stamp set with the Crushed Curry ink. When using the new ink pads … you can emboss, which I did with the clear embossing powder. Then I colored the centers in with the Chocolate Chip marker. I wanted to give my card a fall flair. To continue with the fall theme, I choose to use the “Burlap Ribbon” … however in a very different way. I cut the surged edge off and then pulled it apart. The strings from the burlap ribbon add even more texture because it kinked. I’ve seen this done before and always wanted to try it … what was I waiting for! Here are the ingredients for today’s card … the item numbers are linked to my on-line store. 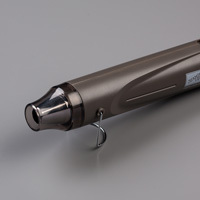 You will be able to see a picture and a description of the product, just by clicking on it. Thanks so much for stopping by today. Tomorrow I’m going to share a card that was inspired by a photo! Wow… can’t believe it’s Friday already. I hope you have the day off for holiday. Update on Mom … everything is stabilized and she will be coming home today. Thank you so much for the prayers and well wishes – I really appreciate your concern, it’s so sweet of you, and you really cheered Mom up. Today I am sharing another card I made using the RMHC (Ronald McDonald House Charities) 2013-14 exclusive stamp set “TAG IT”. Oh my gosh, this set is so cute… so I’ll be sure to post more for you. The “TAG IT” stamp set coordinated with the Chalk Talk Framelit dies, adding a nice touch to this set. I went a bit bold with my color pallet today, I figure that if your sending out congratulations, you may as well say it loud, and say it proud! Maybe these are someones school colors!! 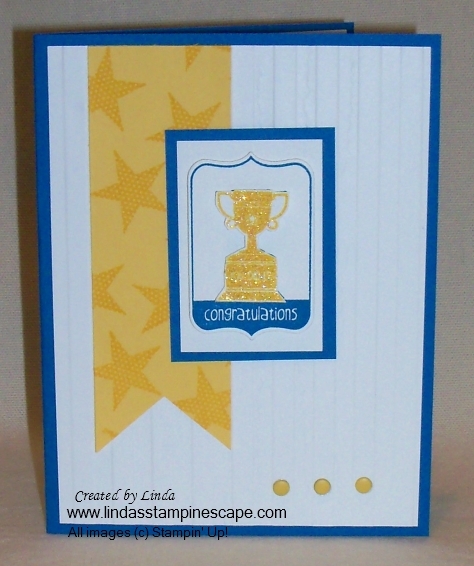 The trophy was heat embossing with Iridescent Ice embossing powder and the new Daffodil Delight ink pad (no need for an additional ink pad anymore)! 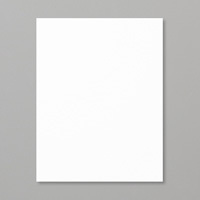 The background was embossed with the Big Shot and stripe folder. 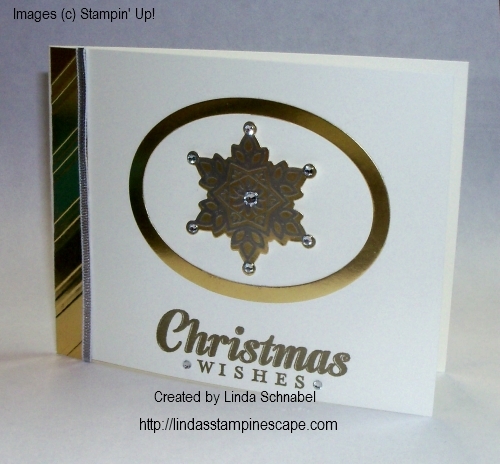 I also used the Simply Stars stamp set that I used on yesterday’s holiday card!! The Daffodil embellishments on the bottom of the card are the “new” Candy Dots … aren’t they cute! I just love them. 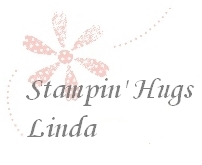 Remember… for each “TAG IT” Stamp Set sold, Stampin’ Up! donates $3 to the Ronald McDonald House Charities. My personal goal is to sell 100 this year. I appreciate you stopping by to see my post today.